to see, touch, and hear what has caught our attention. It's romantic to think plants waft out lovely aromas for our benefit alone, but the scents we enjoy are part of a plant's daily grind. Plants produce many compounds during their normal metabolic activities, some of which serve to attract beneficial insects, or protect against herbivores and disease. One type of compound, called “essential oil”, is responsible for the fragrance in foliage and flowers. Plants use one of two basic methods for storing essential oils. The first is on the surface of the leaf in hairy structures called glandular trichomes. These plants need only be brushed against to release their aroma, and are often quite fuzzy in texture. The second storage method utilizes specialized structures inside the leaf. These plants need to be crushed or bruised to release their aroma and may or may not be fuzzy (fuzz does not always mean a plant has essential oils). Rosemary (Rosmarinus officinalis): A great culinary herb with evergreen foliage and pretty bluish flowers requiring little maintenance. A nice shrubby variety is ‘Mozart'; ‘Prostratus' is a low-growing variety for retaining walls. Sage (Salvia spp): Culinary sage (Salvia officinalis) is quite popular, but there are more drought-tolerant species to be had. Two intensely aromatic species are White sage (Salvia apiana) and Cleveland sage (Salvia clevelandii), which your nose will find from a great distance. More subtle are Autumn sage (Salvia greggii), Germander sage (Salvia chamaedryoides), and Hummingbird sage (Saliva spathacea). Lavender cotton (Santolina chamaecyparissus): A bright, silvery plant with cute yellow buttons for flowers and frond-like foliage with an aromatic, pungent fragrance. 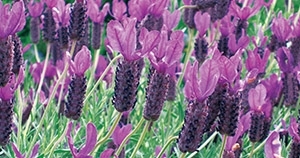 Attractive to pollinators, low-growing, and appreciative of well-drained soil. Spice bush (Calycanthus occidentalis): A large, deciduous shrub with lovely red flowers in spring. The foliage emits a clean, spicy fragrance when crushed. Spicebush is less fussy about soil and summer water than some of the species listed here, but does OK in water-wise gardens as well with a few deep watering a month in the dry season. Yarrow (Achillea spp): Although the wild species is quite aggressive, the cultivars are better behaved, while still offering up a nice scent. Yarrow comes in many colors, from yellow-orange to pinkish lavenders and reds. Some of my favorites include Woolly yarrow (Achillea tomentosa), and the many cultivars of our native yarrow (Achillea millefolium), including ‘Island Pink', ‘Paprika, and 'Terracotta'. Plants tend to go about their business, and the essential oils they produce may not be for our benefit alone, but their addition to the garden experience has endeared them to us. The lovely fragrances possible for the water-wise garden provide just one more reason to try them out!